This durable prefinished solid real maple scraped floor will enhance the value of your home. The flooring is made of 3/4 in. thick sawn solid wood and features mother nature’s naturally occurring beauty marks such as distinctive color variation, knots and mineral streaks. The time-worn scraped appearance accents all of the woods natural character. The floors plank length is totally random and varies based upon the yield of each tree. The aluminum oxide finish provides more abrasion resistance than ordinary urethane finishes. Vintage floors may contain naturally occurring light and dark wood colors plus grain variations. Our flooring is proudly crafted in Tennessee from responsibly harvested wood. Expertise and experience assure a beautiful, high quality floor. Our company has been crafting wood floors of exceptional quality for over 115 years. This floor is safe for your home and exceeds CARB Phase II and FloorScore Air Quality Requirements plus qualifies for LEEDS points. 3/4 in. Thickness x 5 in. Width x Random Length Planks up to 78 in. 23 sq. ft. per case and case weight: 69 lb. 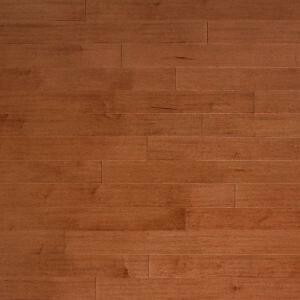 Buy online Heritage Mill Scraped Vintage Maple Velvet 3/4 in. Thick x 5 in. Wide x Random Length Solid Hardwood Flooring (23 sq. ft. / case) PF9783, leave review and share Your friends.